Anyone who sails and has heard the story of the Mutiny on the Bounty, may dream of one day visiting Pitcairn Island (pronounced Pitkern). 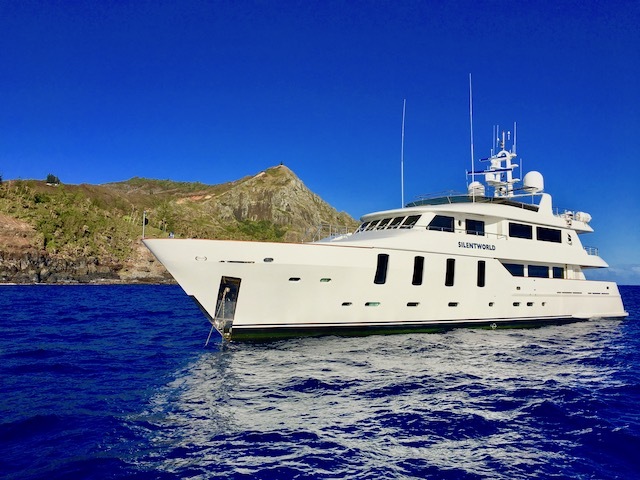 It is entirely possible and well worth the effort for those traveling through the South Pacific with a well found yacht and by those who are capable of being independent. Those making the effort to find the island, which is only two miles long and one mile wide, are assured of one of the warmest and most genuine welcomes that you are ever likely to receive. Currently an average of only twenty-five yachts visit in any one year. If you are blessed by good weather nearly everyone wants to stay longer than planned. Most people approach Pitcairn Island, westbound from the Galapagos, Easter Island or South America. Pitcairn Island lies just outside the normal Southern boundaries of the SE trade winds and Tropical Storm Zone and is therefore an ideal place to visit before the season for French Polynesia. Reasonably easy and quick passages can be expected by those using the trade winds. It is also quite possible from the Gambia Islands (French Polynesia), 290 nautical miles to the North West. 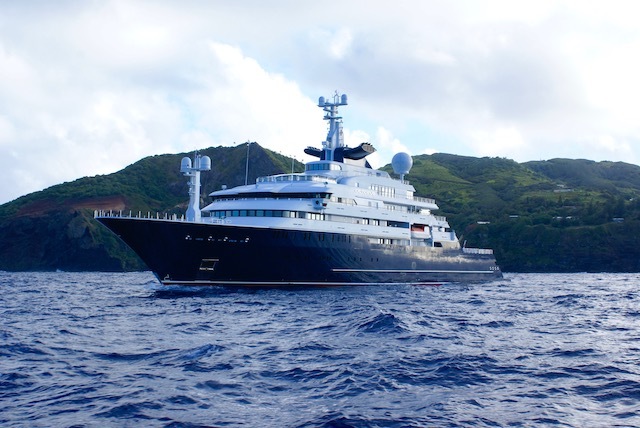 Pitcairn Island is approximately 1100 feet high and can be seen from about 25-30 miles away on a yacht - visibility and swell allowing. Approaching from the East, Pitcairn Island Island appears to have a saddle in the middle of it. This is where you should initially aim for. As you near the island, toward Bounty Bay there appears to be a distinctive pinnacle, high above the bay - again head toward this pinnacle. The pinnacle (Ships Landing Point) is situated on the Southern edge of Bounty Bay, above the landing area. Suggested waypoint (WGS84) is 25o 03.987S 130o 05.702W. This will put you on a line between the tree on Adams Rock and Isaacs Rocks. You will be approximately 350m from the landing and will be able to see the sloping boat sheds. If coming from the North or South staying one mile off the coast will keep you well clear of any hazards, until you are able to lay a course directly into Bounty Bay from the East. 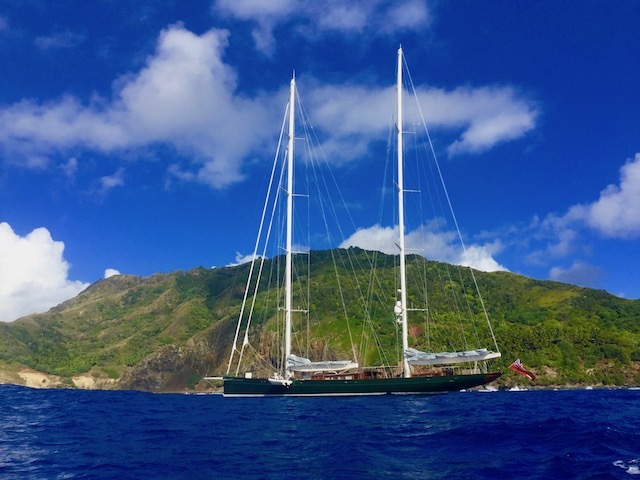 It is possible to contact Pitcairn prior to arriving by email, but otherwise, calling on VHF Channel 16 (call sign Pitcairn) from about 12 miles out will normally illicit a response, during daylight. It is worth asking advice as to where to anchor. In addition to Bounty Bay, there are 3 other potential anchorages; Tedside, Ginger Valley and Down Rope. Their suitability depends on wind and swell conditions. Bounty Bay is useable in conditions up to and including Force 4, but if the swell is from the South it can be extremely roily. Your best advice is to listen to the information on where to anchor from the locals. They are able to scout the anchorages from the land if needed. In Bounty Bay the sand can be clearly seen and you should aim to anchor between the eleven and fourteen meter contours. If using chain, at least five times the depth is recommended for peace of mind and your yachts security. The swell could drag out anything less. Aim to lie so that your anchoring circle is outside a line between 25o 03.853 S 130o 05.937 W and 25o 04.14 S 130o 05.544 W.
It is possible to enter Bounty Bay safely at night if there is enough ambient light. Before 2200 local time (UTC -8), shore side yellow street lights may be visible by the landing. There are other yellow street lights. Again call on the radio and seek local advice. If called on the VHF Islanders will make arrangements to come and pick you up from your yacht - weather permitting. Put fenders down on the lee side and let the locals do the rest. For the first time this is highly recommended as a large amount of skill and experience is needed to negotiate the swell on the approach to the landing area at Bounty Bay, unless it is absolutely flat. This is extremely rare. Clothing should be comfortable, loose and something you don't mind getting wet, muddy and, in the summer months, very dusty. You will be met if they didn't pick you up, by the combined Police & Immigration, Quarantine and Tourism Officials. Remember to carry with you your passports and ships registration document. Remember also to bring some drinking water with you - after a long voyage the very hot weather and steep climbs will soon dehydrate you. Nothing else is required. Please do not attempt to land rubbish or any plants, fruits, vegetables, or Honey and Honey products. The paperwork you will be relieved to hear is minimal and those used to Panama, South America and the Galapagos will be delighted by its ease. The Landing fee is US $50.00 per person, with the "Taxi Service" costing US $50.00 for the trip in and out. This can be shared between yachts. You'll be warmly welcomed by the Tourism Coordinator, given a quick familiarization visit, some tourist information and you're likely to be invited for tea, coffee and fruit somewhere. There are two places that provide meals at very reasonable prices ($12-15 per person) and you are able to have alcohol with your meal. Takeaway meals can be ordered as well - if you feel like taking something back to the yacht. In no time at all you will feel like you have become the personal guest of almost all of the Pitcairn Islanders you encounter. In Adamstown village you will find the Post office, General Store, Museum, Public Hall, Seventh Day Adventist Church, The Government Treasury - where you can get cash on credit cards and the Pitcairn Island Medical Center and Doctor. Generally all facilities are open in the morning on Sunday, Tuesday and Thursday. Saturday is the sabbath and you are welcome to attend the local church for the interdenominational service, where you will likely meet several local residents and off island professionals. As you come across the locals don't be afraid to ask to see their handmade crafts and curio. There is a wide range available at very reasonable prices and most are quite unique to the island. Depending on the time of the year, fruit and vegetables are available at very reasonable prices. Pitcairners are incredibly generous and would rather share what little they have than see it go to waste. Please don't abuse this, as even a small donation goes along way. The General Store has a good range of basic supplies and accepts a range of currencies. Every item has to be brought in on the supply ship that arrives approximately every three months. Fresh baked bread and home range eggs are often available from locals as well. The Post Office stocks the world renown Pitcairn Stamps and First Day Covers. Limited numbers are produced and after two years all remaining stocks are destroyed. In 2013 the islanders set up a Sailor’s Day Room at their temporary Cultural Centre at Bob’s Valley. It’s a great little space, with a shaded deck, arm chairs, local information and books available for exchange. You’ll find it’s a relaxing place to just chill out between meeting the locals and exploring the island. 24 hour internet access is available at one of the local Cafes by arrangement. 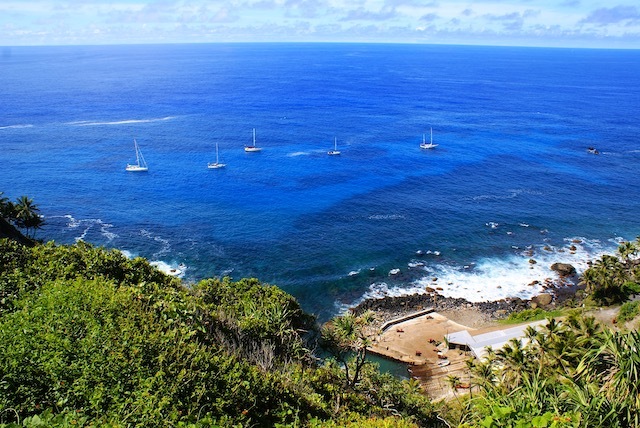 If you enjoy walking there are plenty of well marked tracks, of varying difficulty, that lead to many of Pitcairn's historic sights and always, there are the spectacular views. Though Fuel may not be available and water can be very scarce in the summer months, the necessary skills of the islanders, mean that many boat repairs can be undertaken, including some welding of aluminum and stainless steel. The going rate is usually around US $12.00 per hour and for that you get a lot of effort. If your looking for more information try Charlie's Charts of Polynesia - where you will find has an accurate sketch map of Bounty Bay and the profile of the Island. 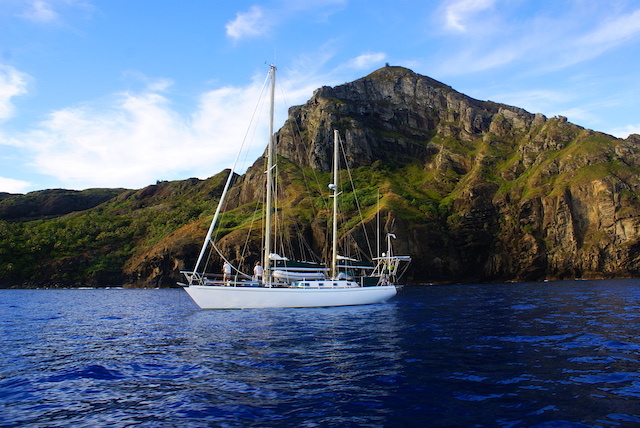 With the arrival of the internet and satellite communications, Pitcairn Island's radio communications are now restricted to VHF and Ham radio enthusiasts, though the old radio station still exists at the top of the island and is well worth a look.